Most women choose to have extra nice hair and makeup on their wedding day to look their best in photographs. Unfortunately, it’s not always easy to do your own hair and makeup on your wedding day while getting dressed and completing tasks. 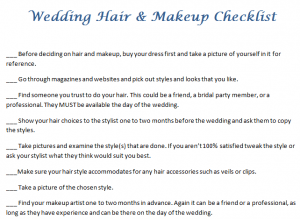 The Wedding Hair and Makeup Checklist is an easy and effective way to arrange your style for your big day. How your hair and makeup will look depends on three things: your dress, the wedding theme, and the location. You don’t want slack hair with an elaborate ball gown, or a crowded up-do for a rustic theme. Anything elaborate will quickly come undone at a windy beach wedding. Take this into consideration when look at hairstyles and makeup. It’s crucial to find a hair stylist you can trust to be available and skilled. There are many stylists who only do wedding hair, and they can be booked for trials and for the wedding day. Likewise, makeup artists can specialize in events and most importantly, be on hand during the wedding for touch-ups. Bring one or two friends with you when doing hair and test runs. Don’t bring more than two, as too many opinions can cloud your judgment, so stick with just those you trust. If you plan on dancing a lot, or are having an outdoor wedding, wear the hairstyle and makeup for a day and see how it holds up. You may be used to seeing yourself in only way, so allow the stylists to try what they think may fit you. You can either ditch that look, or find that it does suit you better for the wedding day. On the day of the wedding, have the hair and makeup stylists available for yourself and, if contracted, your bridesmaids. Make sure that before photos, you let the stylists touch-up your look. Finally, avoid tanning, dying your hair, drastically changing your style, or trying new products (in case of an allergic reaction).